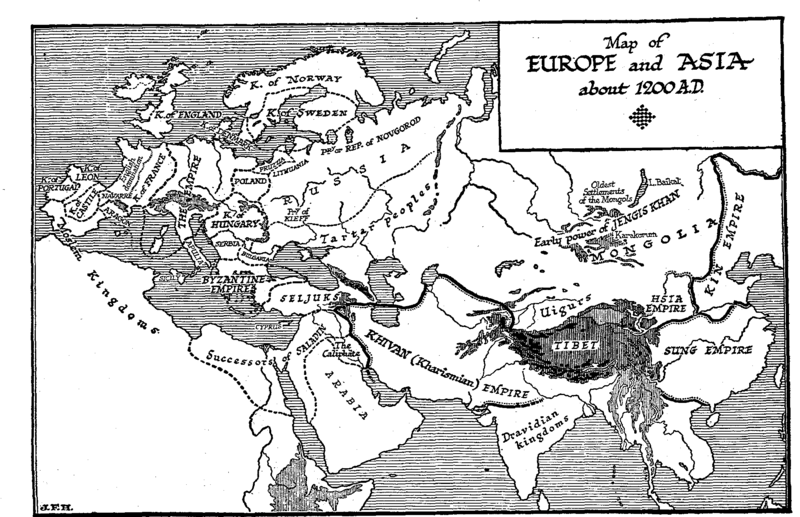 Figure 668: Map of Europe and Asia about 1200 A.D.
We have to tell now of the last and greatest of all the raids of nomadism upon the civilizations of the East and West. We have traced in this history the development side by side of these two ways of living, and we have pointed out that as the civilizations grew more extensive and better organized, the arms, the mobility, and the intelligence of the nomads also improved. The nomad was not simply an uncivilized man, he was a man specialized and specializing along his own line. From the very beginning of history the nomad and the settled people have been in reaction. We have told of the Semitic and Elamite, raids upon Sumeria; we have seen the Western empire smashed by the nomads of the great plains and Persia conquered and Byzantium shaken by the nomads of Arabia. Whenever civilization seems to be choking amidst its weeds of wealth and debt and servitude, when its faiths seem rotting into cynicism and its powers of further growth are hopelessly entangled in effete formula, the nomad drives in like a plough to break up the festering stagnation and release the world to new beginnings. The Mongol aggression, which began with the thirteenth century, was the greatest, and so far it has been the last, of all these destructive reploughings of human association. From entire obscurity the Mongols came very suddenly into history towards the close of the twelfth century. They appeared in the country to the north of China, in the land of origin of the Huns and Turks, and they, were manifestly of the same strain as these peoples. They were gathered together under a chief, with whose name we will not tax the memory of the reader; under his son Jengis Khan their power grew with extraordinary swiftness. The reader will already have an idea of the gradual breaking up of the original unity of Islam. In the beginning of the thirteenth century there were a number of separate and discordant Moslem states in Western Asia. There was Egypt (with Palestine and much of Syria) under the successors of Saladin, there was the Seljuk power in Asia Minor there was still an Abbasid caliphate in Bagdad, and to the east of this again there had grown up a very considerable empire, the Kharismian empire, that of the Turkish princes from Khiva who had conquered a number of fragmentary Seljuk principalities and reigned from the Ganges valley to the Tigris. They had but an insecure hold on the Persian and Indian populations. The state of the Chinese civilization was equally inviting to an enterprising invader. One last glimpse of China in this history was in the seventh century during the opening years of the Tang dynasty, when that shrewd and able emperor Tai-tsung was weighing the respective merits of Nestorian Christianity, Islam, Buddhism, and the teachings of Lao Tse, and on the whole inclining to the opinion that Lao Tse was as good a teacher as any. We have described his reception of the traveler Yuan Chwang. Tai-tsung tolerated all religions, but several of his successors conducted a pitiless persecution of the Buddhist faith; it flourished in spite of these persecutions, and its monasteries played a somewhat analogous part in at first sustaining learning and afterwards retarding it, that the Christian monastic organization did in the West. By the tenth century the great Tang dynasty was in an extreme state of decay; the usual degenerative process through a series Of voluptuaries and incapables had gone on, and China broke up again politically into a variable number of contending states, «The age of the Ten States», an age of confusion that lasted through the first half of the tenth century. Then arose a, dynasty, the Northern Sung (960-1127), which established a sort of unity, but which was in constant struggle with a number of Hunnish peoples from the north who were pressing down the eastern coast. For a time one of these peoples, the Khitan, prevailed. In the twelfth century these people had been subjugated and had given place to another Hunnish empire, the empire of the Kin, with its capital at Pekin and its southern boundary south of Hwangho. The Sung Empire shrank before this Kin Empire. In 1138 the capital was shifted from Nankin, which was now too close to the northern frontier, to the city of Han Chan on the coast. From 1127 onward to <B>1295,</B> the Sung dynasty is known as the Southern Sung. To the northwest of its territories there was now the Tartar Empire of the Asia; to the north, the Kin Empire, both states in which the Chinese population was under rulers in whom nomadic traditions were still strong. So that here on the east also the main masses of Asiatic mankind were under uncongenial rulers and ready to accept, if not to welcome, the arrival of a conqueror. Northern India we have already noted was also a conquered country at the opening of the thirteenth century. It was at first a part of the Chive empire, but in 1206 an adventurous ruler, Kutub who had been a slave and who had risen as a slave to be governor of the Indian province, set up a separate Moslem state of Hindustan in Delhi. Brahminism had long since Buddhism from India but the converts to Islam were still but a small ruling minority in the land. Such was the political state of Asia when Jengis Khan began to consolidate his power among the nomads in the country between Lakes Balkash and Baikal in the beginning of the thirteenth century.